In what may end up being a case of brilliant irony, I'm writing this just hours before I get on a plane. If said plane does crash, and I don't survive, I'll look like a right idiot! Although I bet my blog views would go through the roof. So every cloud has a silver lining. I'm lucky enough to not have a fear of flying. A few of my friends do - they spend the majority of the flight time staring straight ahead, white knuckles gripping the seats. One friend cries throughout the entire journey. I'm quite far in the other direction. 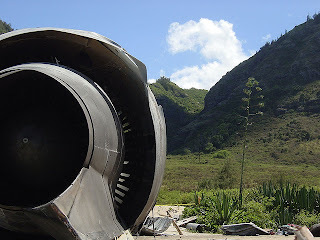 After a bit of an obsession with Lost, I tend to fantasise about my plane crashing. Just out of curiosity, you understand, not in a weird way. Whenever I'm lining up to board a plane, I do a quick scan of my fellow passengers. Why? Because I need to figure out who to make an alliance with if we crash on a desert island. I suss out the people who look strong, the ones who look practical, and the sturdiest of the group. I judge purely on appearance, and I do it quickly. I used to sit in the emergency exit aisles, but that was more a leg room thing. I once joked to someone sitting next to me that if we did crash, I'd open the door, get myself out and then close it behind me, to give me a better chance of survival. At least, he was under the impression I was joking. I don't tend to watch the safety announcements, but I probably should. 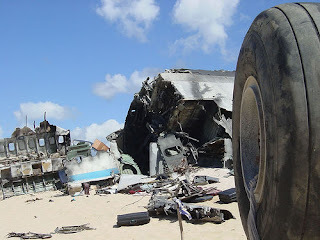 "A Boeing 727 carrying cameras, sensors and crash test dummies with breakable bones was deliberately crashed into the Sonoran Desert in Mexico earlier this year. Three dummies were also arranged in various positions: one in the classic “brace” position and with a seat belt fastened, one with just the seat belt fastened, and a third with neither. Following analysis of the crash, it has now been claimed that passengers at the front of the aircraft – usually reserved for first-class, business-class or premium-economy passengers – were less likely to survive." In fact, no one survived in first class (HA! Take that, Richie McRich. At last we in steerage come out on top!) while 78% of the rest would have. That is, of course, provided they wore a seatbelt and held the brace position. Well, if nothing else, I've got an interesting few facts for whoever sits next to me on the plane.